Se lleva a cabo un estudio comparado de un tema jurídico, concretamente el divorcio en el Derecho español y alemán, amén de un análisis textual contrastivo de una sentencia de divorcio española y una alemana, subclase textual perteneciente a dicho tema. La autora defiende y postula el empleo del Derecho comparado y del análisis textual contrastivo de múltiples niveles como la mejor forma para abordar los procesos de traducción jurídica en los casos en que la traducción se realiza entre dos lenguas diferentes y dos ordenamientos jurídicos distintos. 30 ejercicios de Traducción Jurídica. – Aprenderás expresiones jurídicas para empezar a expresarte como un abogado. – Podrás trabajar la traducción directa y la inversa. – Conocerás terminología esencial para un traductor en las ramas de Derecho Procesal Civil y Penal y del Derecho de contratos. Ce livre a été confectionné a I’intention de juristes ou d’apprentis juristes étrangers, pourvus d’une connaissance assez avancée du francais général et qui, souhaitant s’ouvrir a un systerne juridique différent du leur, rencontrent un écueil dans la langue francalse a usage spécialisé. La révision systématique de la grammaire francaise dans le cadre du droit (rnatlere civile uniquement) est complétée par I’étude d’autres ressources linguistiques propres au domaine. Une partie importante de I’ouvrage est consacrée a la pratique de la langue du droit civil dans ses aspects professionnels et elle est suivie d’une série de documents professionnels en usage chez les juristes, susceptibles d’apporter un complément d’information et de formation. Quelques textes littéraires a therne juridique et un glossaire de termes ferment I’ensemble. Cet ouvrage comprend de tres nombreux exe r ctce s pratiques avec un corrigé, ce qui facilitera son utilisation autant avec un professeur qu’en auto-apprentissage. Danielle DUBROCA GALlN est licenciée en Lettres (Paris III-Sorbonne) et professeur ertifié de I’enseignement franc;ais. Spécialisée en linguistique, elle est docteur en Langues romanes (1983, Paris IV-Sorbonne). Actuellement professeur titulaire de l’Université de Salamanque (Espagne), elle enseigne depuis 1976 la langue franc;aise et les cultures qui s’y rapportent. Sans jamais délaisser la langue franc;aise générale, son lntérét s’est porté sur le franc;ais des spécialités, dans un premier temps sur le francals dit des affaires (économie et entreprise) et plus tard sur le francals dit juridique, toujours dans le contexte du FLE (Francais Langue ~trangere). Depuis une vingtaine d’années, elle dispense des cours de traduction vers le francais dans le cadre de la licence et du master du Département de Traduction et Interprétation. Francophone, elle ceuvre pour la diffusion et la promotion de la langue française. Ses publications et ses recherches s’inscrivent dans la ligne de son enseignement, en particulier : Correspondance commerciale courante en espagnol et en irenceis (2005). Unlike most articles interpreters will read in professional journals, this piece has little to do with the advancement of interpreter practice in the judicial setting. Rather, it is intended as a warning bell for interpreters who seek full-time employment in a court system. What follows is the experience of just one office, but it illustrates a troubling trend, so interpreters take note: the prognosis may be grim for your professional future if you sign on with a court system in the throes of management upheaval. “Doing justice to court interpreting.” Interpreting vol. 10, n. 1 (2008). pp. 1-7. This manual is intended to inform interpreters of their professional and ethical responsibilities so that they are better able to deal with the difficulties that commonly arise in matters involving non-English-speaking parties in the judicial system. It also serves as a reference and springboard for discussion in conjunction with the Judicial Council Ethics Workshop, which is provided as an integral part of the education and certification or registration of court interpreters in the State of California. In addition to the regulations and recommendations provided here, it is important to note that different courts have their own rules and ways of conducting business. It is the interpreter’s duty to learn and follow these rules as well. In the courtroom, the judge is the final arbiter of what is appropriate. The more prepared and informed you are about professional practices and the purpose of established norms and principles, the more you, together with all officers of the court, will be able to further the interests of justice. This manual is based largely on the rules and principles set forth in rule 2.890 of the California Rules of Court (“Professional conduct for interpreters”, see appendix A); California Standards of Judicial Administration adopted by the Judicial Council of California for interpreted proceedings (Standard 2.10 and Standard 2.11; see appendix C); the Standards for Performance and Professional Responsibility for Contract Court Interpreters in the Federal Courts (see appendix E) and W. E. Hewitt, Court Interpretation: Model Guides for Policy and Practice in the State Courts, Publication R-167 (Williamsburg, Virginia: State Justice Institute, 1995). Court interpretation and translation has always been perceived even by the most experienced interpreters and translators as a challenging endeavor, especially when dealing with languages as distinctly different as English and Russian. Not only are these languages hard to compare using the usual tools available for language studies (comparative grammar, lexicology, stylistics, etc. ), but they are as far apart as languages can be, when examined by their genealogy and development. Nevertheless, the common properties of all languages make interpretation and translation possible, and equivalence can be achieved, though often it takes laborious efforts on the part of the interpreter or translator. This is why, especially when dealing with such a specific field as court interpretation, the search for quality reference materials is so important, for we rely on these works to clarify a multitude of problems. With many of Hawaii’s experienced interpreters no longer able to afford to work in the state courts, Hawaii may face a shortage of qualified interpreters in the future. The Hawaii judiciary, which has not raised the minimum court interpreter pay for two decades, received a hand-delivered petition in September signed by 64 freelance interpreters..
Court interpreters in California have won the right to organize in pursuit of better pay, working conditions and professional standards. A new law signed by the governor and sponsored by two professional associations will, for the first time ever, enable some 1300 certified and registered interpreters in California to join together as a group and negotiate a contract with the courts. Court interpreters and attorneys have a special interest in the issues raised on appeal that involve foreign-language interpretation. In this paper I will focus on the most important interpreter-related cases of the past twenty years, especially those of the past decade, with occasional reference to earlier appeals which have been highly significant. Berk-Seligson, S. “Judicial systems in contact Access to justice and the right to interpreting/translating services among the Quichua of Ecuador.” Interpreting vol. 10, n. 1 (2008). pp. 9-33. The Quichua of Ecuador, along with other indigenous peoples of Latin America, have been struggling to attain the right to use their ancestral language and their traditional ways of administering justice in an effort to gain greater autonomy in a variety of sociopolitical spheres of life. Based on interviews with 93 Ecuadorians ­ judges, magistrates, lawyers, justices of the peace, interpreters, translators, and local and national political leaders ­ the study finds an ideological splintering of views on this subject. Among the disparate Quichua communities and among State justice providers (largely comprising the hegemonic mestizo/blanco sector of society) there is a lack of agreement on how justice is to be carried out and what role the Quichua language should play in it. Despite the heterogeneity of views, however, there is tacit agreement on one de facto language policy, namely, the use of untrained, ad hoc interpreters in judicial settings. At this moment in the twenty-first century, displaced human beings are increasingly seeking refuge in safe-haven foreign countries. For lawyers assisting refugee clients, communication is a fundamental issue. Frequently the lawyer and refugee client do not share a common verbal language. Consequently, lawyers rely heavily upon the specific expertise of interpreters and translators to ascertain essential information from the client. Administrative decisions by government bodies and courts in Australia demonstrate that a team approach by lawyers, interpreters and translators is required for the optimum preparation of a refugee client’s case. Communication is likely to get disrupted when words are taken out of context. Context is a concept that belongs as much to the sphere of linguistic and psycholinguistic research as it does to everyday communication. A layperson may not know the types of context that linguists single out for analysis, but people intuitively know that context is essential for successful communication. La figura del intérprete jurado está siendo objeto de una atención creciente en el momento actual, caracterizado por la proliferación de programas de formación especializados en traducción e interpretación que proporcionan cauces alternativos para el acceso al ejercicio de la traducción e interpretación en múltiples ámbitos profesionales. Uno de los principales ejes de debate radica en la heterogeneidad de funciones asignadas al intérprete jurado que, además de traducir documentos, puede ser requerido para interpretar ante un tribunal sin haber acreditado en ningún momento su dominio oral de la lengua extranjera ni de las técnicas básicas de la interpretación. Este artículo revisa las circunstancias históricas que condujeron a la aparición del intérprete jurado en España tal y como lo entendemos en la actualidad, poniendo de relieve el inmovilismo que ha caracterizado su evolución en los últimos dos siglos. A Continuación, se analizan las consecuencias negativas que pueden derivarse del sistema actual de nombramiento de intérpretes jurados para la administración de justicia, teniendo en cuenta las repercusiones procesales que ha tenido la introducción de la Ley del Jurado en nuestro país. Finalmente, se esbozan algunas vías para la evolución futura de los intérpretes jurados y de las nuevas funciones que éstos comienzan a asumir en una comunidad receptora de inmigrantes procedentes de las más diversas culturas. Capellas, J. F. (2000). La obtención del título de traductor jurado en España. Since the academic course 2006-2007 the University of Alcalá, Madrid, offers a Master on Intercultural Comunication, Public Service Interpreting and Translating taught in five language pairs (Spanish and Arabic, French, English, Polish and Romanian). Within its syllabus two activities on line were designed in order to complement two subjects: Healthcare Interpreting and Legal and Administrative Interpreting. The purpose of this article is to describe, on the one hand, some technical issues related to the design and practice of these activities such as students’ degree of participation and satisfaction, problems that occurred and solutions that were taken to solve them and, on the other hand, to analyse issues related to the teaching and learning of specialized vocabulary, the use of strategies to translate terminology from one language into another and the evaluation methods of the teaching staff. Eventually, we will try to draw conclusions about the applicability of our experience in the teaching of interpreting. This is a corpus-based study that investigates instances in which court interpreters in Hong Kong deviate from using direct speech and the first person, notwithstanding the requirement to use both of these when rendering statements made by witnesses or defendants. Quantitative data indicate that court interpreters do adhere to this requirement when interpreting Cantonese into English, but deviate from it when interpreting English into Cantonese. These data suggest that the use of reported speech and/or of the third person has identification functions that help Cantonese-speaking witnesses and defendants follow court proceedings and serve the pragmatic function of adding illocutionary force to interpreted utterances. Data from interviews with interpreters and legal professionals suggest that some latitude is exercised and tolerated when interpreters deviate from using direct speech and/or the first person when the target language is Cantonese. The findings indicate that court interpreters in the corpus observe strict professional guidelines by using direct speech most of the time, but occasional deviation from the direct approach suggests that court interpreters are able to make discretionary decisions to facilitate communication. Christensen, P. “Judges’ deviations from norm-based direct speech in court.” Interpreting vol. 10, n. 1 (2008). pp. 99-127. This article presents a small-scale empirical study of legal discourse which focuses on the use of direct and indirect speech in Danish interpreter-mediated court proceedings. The study analyses the practices of three Danish judges in three different interpreted proceedings. The primary objective of the paper is to study the potential correlation between the use of direct and indirect speech styles and certain stages of court proceedings. These stages are defined and classified in terms of explicit prescriptive legal norms ascribable to the participants in Danish court proceedings, acting in accordance with a predefined style of interaction (direct speech). In addition, the study investigates whether what the judges say about their speech style corresponds with their actual language use in court. The techniques combined in the study are survey research, participant observation and descriptive analysis based on transcriptions of authentic data from three audio-recorded criminal cases conducted by district courts in Denmark. Driesen, C. J. “Die Nurnberger Prozesse Zur Bedeutung der Dolmetscher fur die Prozesse und der Prozesse fur die Dolmetscher Simultandolmetschen in Erstbewahrung: Der Nurnberger Prozess 1945. Mit einer orientierenden Einfuhrung von Klaus Kastner und einer kommentierten fotografischen Dokumentation von Theodoros Radisoglou sowie mit einer dolmetschwissenschaftlichen Analyse von Katrin Rumprecht.” Interpreting vol. 10, n. 1 (2008). pp. 159-163. [June 9, 1997] – Since 1992 I have been a staff court interpreter for the Superior Court of New Jersey at Middlesex County Courthouse in New Brunswick. When the court system was unified in 1995, court workers, previously county employees, had the opportunity to unionize for representation in negotiations with our new employer, the state of New Jersey. The anatomy of the profession was laid bare recently when the Court Education Division of the Federal Judicial Center sponsored a two-day workshop for court interpreters in Albuquerque, New Mexico. About 125 staff and freelance interpreters from all over the country attended. The last opportunity to share information in a forum of this kind was in 1993, and they clearly relished the occasion to report from far-flung precincts and receive updates on national trends and issues. After the boxing ring, the courtroom may be the closest that the modern age comes to the Roman Coliseum. A celebrity case or the lesser lights of local scandal always attract a throng to watch the conflict. With high-profile trials recast as sport or entertainment, experts opine on the players and the process, newscasters keep score, attorneys wield words and reasoning to win the fight for justice and the American way, the judge referees; and when it’s all over, the public takes great glee in defending or deploring the result, indeed the legal system itself. Arabic speakers in the U.S. diplomatic corps capable of appearing on Al Jazeera tomorrow and discuss current events in Arabic can be counted on the fingers of one hand. It’s no secret that America has never made it a priority to attract, groom, train and use its linguists as valuable resources. This paper describes some of the difficulties faced in enabling public service organizations to recognize their responsiblities when working through an interpreter. It highlights the crucial communicative role played by the Service Provider, and urges a process model of in-service training. While recognizing that Police Officers, Social Workers and Probation Officers are all working in different environments and may have conflicting agendas, the model can be adapted to suit each context provided that five main principles are observed. The five principles are described, as is the format for putting them into practice. Service Provider responses to the activities are summarized. The paper concludes that becoming skilled in providing a service to non-English speaking service users is to provide a better service to all, whether English speaking or not. Fowler, Y. (2007). Interpreting into the ether: interpreting for prison/court video link hearings. In April 1998, 1 gave a presentation at a Continuing Legal Education seminar for the Ohio Hispanic Bar Association. My topic was ‘Standards, Training and Certification of Interpreters in Ohio.’ I had for some time been advocating the certification of judiciary interpreters and had had conversations with the Administrative Director of the Ohio Supreme Court concerning the impact of interpreting errors. Another presenter at the seminar, Veronica Dalhberg, spoke on behalf of the Alejandro Ramírez Defense Coalition. I listened to her presentation intently and with disbelief. I knew then that the Ramírez case would some day help to bring about the changes that are needed within the judiciary interpreting profession in Ohio. La legislación vigente, al establecer la posibilidad de que los licenciados en Traducción e Interpretación puedan conseguir el título de Intérprete Jurado sin tener que superar los correspondientes exámenes del Ministerio de Asuntos Exteriores, convierte a las facultades que imparten dicha Licenciatura en responsables, directa o indirectamente, de la preparación de estos egresados con vistas a su ejercicio profesional en el ámbito de la traducción jurada. Con el objetivo de describir y analizar la formación universitaria en traducción jurídica que reciben estos licenciados, en este artículo se presentan los resultados del análisis de los programas de las asignaturas que componen la formación que los egresados han de acreditar para obtener dicha exención de examen, prestando especial atención a los campos temáticos cubiertos por las mismas. A Community Interpretation in Spanish program has existed at Riverside Community College in Southern California for some nine years. The program curriculum was written by Dr. Lisa Conyers, Dean of Instruction at the Moreno Valley campus. Although not an interpreter herself, Conyers, whose expertise is in Spanish and comparative literature, saw the need in the community for trained interpreters. She developed the curriculum in consultation with working interpreters and interpreter trainers. In the summer of 2000, I was hired as the first full-time faculty member in the program. We continue to benefit from the experience of two certified interpreters who are adjunct instructors. Galanes Santos, I. “La acreditación de traductores y/o intérpretes jurados en España: novedades, contrastes e incoherencias.” Sendebar: Revista de la Facultad de Traducción e Interpretación vol., n. 21 (2010). pp. 251-270. Hale, S. “Pragmatic considerations in court interpreting.” Australian Review of Applied Linguistics vol. 19, n. (1996). pp. 61-72. At the recent Chicago conference, I interviewed two people who are involved in interpreter representation. Jorge Carbajosa is a Cook County state court interpreter and one of the organizers of the Interpreters Working Group (IWG), a small group of interpreters organizing to attain professional representation in the Cook County state courts. In Cook County all interpreters are state employees. The working group is seeking to increase pay rates and define the position. ‘It has been a difficult and slow process,’ commented Mr. Carbajosa, referring to a two-year effort to coordinate the working group’s participation in the Communication Workers of America Union, which is associated with The Translators and Interpreters Guild and has experience in other states, such as New Jersey. Sooner or later, a judiciary interpreter is bound to come into contact with psychiatric assignments. Exposure to this facet of our judicial system may materialize in a variety of forms. One may be mass calendar calls of yellow-clad (in many counties) inmates claiming or suspected to be unfit to comprehend the charges against them or stand trial, some of whom may have requested removal to state psychiatric facilities. Judges issue rulings in individual hearings and order psychiatric examinations, referred to by section number, depending on the objective of the evaluation. At the opening session of NAJIT’s Silver Anniversary Meeting and Educational Conference in Denver on May 22, 2004, as I listened to keynote speaker Dr. Virginia Benmaman discuss the rocky path of judiciary interpretation in the United States, I could not help but take a second look at my career and my own place in our profession’s history. Dr. Benmaman, distinguished Professor Emeritus and current director of the MA Program in Bilingual Legal Interpreting at the Graduate School of the College of Charleston, South Carolina, delivered an enlightening speech with an invitation few in the audience could resist: this is a time not to cry for our future but to pat ourselves on the back. Jacobsen, B. (1999). Court Interpreting in Denmark-A Critical Perspective. Jacobsen, B. “Interactional pragmatics and court interpreting An analysis of face.” Interpreting vol. 10, n. 1 (2008). pp. 128-158. This article reports on an investigation of face in a triadic speech event, a prosecutor’s interpreter-mediated questioning of a defendant in a criminal trial at a Danish district court. The power differential of this particular speech event makes it inherently threatening for the less powerful individual, the defendant, who by consenting to make a statement potentially puts his face at risk in multiple ways. Moreover, his face-protecting strategies may result in the prosecutor’s face being threatened. Simultaneously, while attending to the face-work of the primary participants, the interpreter has her own face to attend to as a professional. Consequently, the aim of the investigation was to explore face-work in the speech event and the interpreter’s strategies for translating and coordinating face-work. The analysis revealed that the interpreter frequently modified face-threatening and face-protecting utterances in an attempt to protect her own face and/or the face of one of the primary participants. Studies of court interpreting have so far neglected interpreters’ choice of mode for interpreting question-answer dialogues, though their choice of mode may impact the way questions and answers are reproduced and received by end receivers. Typically, the (short) consecutive mode, regarded as the more complete mode, is recommended for interpreting these dialogues, because it facilitates the inclusion of features such as hesitations, discourse markers, repetitions etc. which play a significant role in identifying speaker meaning. Moreover, in courts without interpreting equipment, answers interpreted in the simultaneous (whispered) mode will be inaudible to end receivers. Nevertheless, as demonstrated in this article, which is based on a survey among court interpreters in Denmark, some interpreters ignore official recommendations and choose strategies for interpreting questions and answers which potentially hinder the flow of information between the original speaker and listener and the accurate and complete translation of original utterances. Furthermore, Danish courts seem to accept the court interpreters’ behaviour, despite its potential consequences for trial outcomes. The article discusses the reasons for this passivity and its wider implications. The purpose of this article is to introduce the new binational master s programme Legal translating and interpreting . In cooperation with the Université de Bretagne-Sud in Lorient/France, the Hochschule Magdeburg-Stendal (FH) University of Applied Sciences Magdeburg-Stendal, Germany will admit the first 16 students to the master s degree programme next year. National courts and international institutions complain about a significant lack of professionally trained legal interpreters. The master’s programme Legal translating and interpreting aims to remedy this lack and actively prepare students for careers as translators of legal texts, editors/proofreaders of legal texts as well as legal interpreters. Jurists, students holding a degree in applied linguistics, technical translators und (legal) interpreters as well as other from related fields of study may apply for the master’s degree programme. Specific courses offered in the first term will ensure a common state of knowledge among all students. Due to the great demand for translators and interpreters for languages of limited diffusion we plan to open this Master s degree programme for the above mentioned group of students as soon as possible. Lipkin, S. L. “Norms, ethics and roles among military court interpreters The unique case of the Yehuda Court.” Interpreting vol. 10, n. 1 (2008). pp. 84-98. This study examined the activities of military court interpreters at the Yehuda Military Court near Jerusalem over a period of one year. The aim of the study was to examine the norms and ethical rules that guide the interpreters’ work. In-depth interviews were carried out with eleven interpreters and officers, and court sessions were observed. The questions asked related to the interpreters’ powers and duties, the nature of their work, their personal preferences, the rules that guide their work, and the training they receive. The findings show that the interpreters’ powers and duties cover a range of areas over and above interpreting per se, and include translating documents, acting as ushers in the courtroom, and handling logistical matters. The study also pointed to the lack of a clear set of rules in relation to the interpreters’ work, and revealed that training is provided only after they have begun working. The study suggests the need for a code of ethics defining and providing a framework for the interpreters’ powers and duties, which should be limited to interpreting, and should not encompass administrative tasks, as the current situation causes confusion over the ethical boundaries of the interpreters’ work. Actualmente estamos siendo testigos en la Unión Europea de una normalización lingüística sin precedentes gracias a los acuerdos de cooperación en diversas materias y sobre todo en el ámbito judicial. Esta normalización facilita en gran medida la labor de búsqueda de equivalentes terminológicos a los traductores jurídicos, judiciales y jurados. En el presente artículo analizamos de equivalencia terminológica en el ámbito de la traducción jurídica; comentamos las funciones del intérprete judicial frente al intérprete jurado y finalmente ofrecemos dos ejemplos de traducción jurada con su correspondiente comentario traductológico. We are witnessing unprecedented language standardisation in the European Union thanks to cooperation agreements in a number of areas and particularly in the judicial area. This standardisation makes it considerably easier for legal, judicial and sworn translators wishing to find equivalent terms. This article analyses the matching of terms in the area of legal translation, comments on the duties of judicial translators in relation to those of sworn translators and ultimately provides two examples of sworn translation and the respective commentary. The year is 2004. A French interpreter is at the witness stand interpreting for an eyewitness in an armed robbery which took place in a convenience store in northern Vermont almost a year earlier. There are several French speakers in the courtroom hanging on the interpreter’s every word. The interpreter has an air of sang froid about him in spite of his limited experience at the witness stand. He seems to have an extraordinary memory and accurately renders the testimony in the consecutive mode, even when interpreting the witness’s response to that open-ended question: “What, if anything, happened on the date in question?” He omits none of the false starts, changes in intonation, or fillers characteristic of the witness’s long answer. This paper examines the experience, perceptions and narratives of the interpreters who worked at the trial of the Madrid terrorist attacks of 11th March 2004. Using semi-structured interviews as an instrument, information was sought from the members of the interpreting team regarding their role and self-image, their relationship with other professionals during the trial, their management of emotions, pressure and possible conflict, as well as the effect of a high profile case such as this on their interpreting performance. The findings show that the interpreters were generally clear and confident about their professional role and capacity, that their working conditions were inadequate, especially at the beginning of the trial, and that the experience heightened the awareness of other court professionals with regard to interpreting. The nature of the trial, the presence of national and international media, as well as the immense responsibility the interpreters assumed in this case created an atmosphere of intense emotion and pressure. However, most of the participants in this study reported that this did not affect their professional performance. This paper presents a case study of an interpreting event in a Danish courtroom setting. The study investigates the interpreter’s influence on the interaction as well as factors influencing the behaviour of all the participants involved. The study also investigates what happens when the interpreter’s performance is perceived by participants as inadequate in order to achieve the communicative goal of the event. The model of translation culture, in which cooperativeness, loyalty and transparency are key concepts, is used as an explanatory tool. Although the interaction under study, like all courtroom interaction, is determined by the inherent institutional power differential, it is appropriate to describe it in terms of cooperativeness. The conflict regarding the interpreter’s non-normative behaviour is negotiated and settled by way of consensus, and the trial is carried through with the same interpreter despite doubt about her competence. The paper concludes by discussing the effect of special contextual conditions, as well as ethical implications. Mikkelson, H. (1999). Court interpreting at a crossroads. Throughout my professional life, I’ve heard interpreters describe the Nuremburg Trial as the cradle of modern conference interpreting, the first instance of simultaneous interpreting with electronic equipment. Apart from a few isolated articles in the occasional translator/interpreter publication, very little has been written about these pioneer interpreters and the system that was devised to make a four-language trial possible. Francesca Gaibas work puts an end to this relative obscurity, shedding new light on a historic event that would otherwise have receded into the darkness of the forgotten past as the key players died, one by one. Community interpreting is rapidly maturing, as evidenced by the third conference of Critical Link (http://www.criticallink.org/), an international organization founded to promote the profession. The conferences are held every three years, attracting interpreters, interpreter coordinators, policy makers and scholars from all over the world. This year’s event was held May 22-26 in Montreal, a beautiful and historic city known for its concern for language rights. The theme was ‘Interpreting in the Community: The Complexity of the Profession,’ and the logo depicted an acrobat or dancer flexing her body. Mikkelson, H. “The Critical Link 4: Professionalisation of interpreting in the community. Selected papers from the 4th International Conference on Interpreting in Legal, Health and Social Service Settings, Stockholm, Sweden, 2023 May 2004.” Interpreting vol. 10, n. 1 (2008). pp. 169-173. Morris, R. “Missing stitches An overview of judicial attitudes to interlingual interpreting in the criminal justice systems of Canada and Israel.” Interpreting vol. 10, n. 1 (2008). pp. 34-64. Along a continuum of interlingual interpreting which begins with police investigations and may end in a supreme court, consistent quality must be assured in order to comply with the standards of justice to which enlightened countries aspire and lay claim. With the advent of the global village, the quantity of cases requiring language mediation has exploded exponentially. 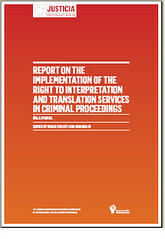 The issues involved are not new, and simply put involve arranging for the provision of competent interpreters throughout the criminal justice system. However, the actual provision of quality interlingual interpreting in a criminal justice system is not a straightforward enterprise. The mere existence of legislation requiring the provision of interpreters in courts is not the key element. Nor are insightful comments made by appellate judges in cases brought because of an absence of satisfactory language arrangements. The article shows the problematic nature of interpreting arrangements in the criminal justice system for which the government and its players ­ even judges ­ assume no responsibility. The resultant ‘missing stitches’ are likely to deprive those who do not speak the language of the proceedings of their fundamental rights. The article addresses a number of topical issues relating to court interpreting. After examining a number of issues discussed among US interpreters in July 2009, it considers the provision of court interpreting in a number of different English-speaking jurisdictions, including the position of agencies. It presents the cost of a lack of judicial awareness of the issues involved in providing competent interpreting in legal proceedings, and looks at how rare languages are dealt with in the United States. It examines best practice and how this can quickly turn into worst practice. It considers the situation in Canada=s Province of Ontario, where a class action has been brought against the Ministry of the Attorney General for failing to provide competent interpreting services. The discussion poses a number of questions, and considers whether court interpreting is condemned to be an undervalued and misunderstood profession in many jurisdictions, or whether there is reason to hope for improvement. Along with the dramatic influx of foreigners into Japan, the number of criminal cases requiring court interpreters has increased in the past decade. Naturally, demands for interpreters of various languages became urgent. However, a lack of understanding and the absence of a training system for court interpreters have placed physical and psychological burdens on the interpreters. In 1992, the Japan Judicial Interpreters’ Association was organized by several court interpreters in Osaka who created a communication network among isolated court interpreters for the exchange of information and for self training with the co-operation of lawyers, and won mass media support. This movement has placed pressure on the Ministry of Justice and the Supreme Court and succeeded in gaining understanding of the authorities. As a result, the working conditions of the court interpreters are greatly improving. Dominique, this novel’s protagonist, is an interpreter whose story unfolds not only through her own eyes but through those of Nicholas, an Italian leukemia researcher on temporary assignment in New York, and Anna, an old friend from interpreting school. The setting is the world of pharmaceuticals and medical conference interpreting. In response to “Requiem for an Interpreters Office” (Proteus, Summer 2001) and “20 Years Without a Pay Raise” (Proteus, Fall 2002), I thought it might be helpful for court interpreters in Arizona and Hawaii (the states described in the articles) and in other states as well to have a point of comparison: the current working conditions for court interpreters in Cook County, Illinois. A review of the literature on foreign language interpretation for immigration court proceedings shows very little work has been done in this area. In Canada the Lexique de l’Immigration provides an extensive French-English glossary, (Ottawa: Bureau de la Traduction, Direction de la terminologie et des services linguistiques, 1990), but there is no work similar in scope in the U.S., although there are abundant source materials that can be used as a basis for a compilation of immigration terms. The most voluminous sample of current documents in English and Spanish is a series of press releases from the Immigration and Naturalization Service (http://www.ins.usdoj.gov/). In Quebec, only Court interpreters are certified by the Ordre des traducteurs, terminologues et interprètes agréés du Québec. However, the other branches of Community Interpretation in settings such as health care or education are not recognized by the Ordre. It can be difficult for an interpreter, not accepted by his peers, to demonstrate his expertise to other professionals. Using a questionnaire addressed to doctors, social workers, etc., and my own experience, especially in ethnopsychiatry, we will see that community interpreters have the necessary skills to become members of a professional order. As such, they will be officially considered as the full-fledged professionals that they have always been. NAJIT’s position on the so-called Court Interpreter Advisory Subgroup’s determination that there is ‘no need’ for an increase in the per diem rates paid to contract federal court interpreters, which have not been adjusted since March 1991. Ireland used to be a country of net emigration but over the last decade there has been a steady increase in immigration by asylum seekers and by workers from the European Economic Area and from outside Europe. There has been a rapid change from an exclusively English speaking country to a multilingual one with up to a hundred languages being spoken. Clearly this presents particular problems when non-English speakers are in contact with officialdom. Interpreting is provided in the courts, in police stations, in hospitals and over the phone for doctors. But the interpreters receive absolutely no training in interpreting. They are not tested and there is no forum where they can receive guidance on ethical issues. The official attitude is that these foreigners will learn English and will no longer need interpretation. The discussion will focus on what can be done to increase awareness of the issues surrounding Community Interpreting?. Working with a witness or client through an interpreter requires patience and practice. The interpreter is sworn to interpret truly and accurately, but source and target-language utterances rarely result in a perfectly neat match. The common perception is that interpreters just repeat words, but the process of interpreting is a complex task for the brain, one that involves many cognitive skills. Lawyers would do well to remember that interpreters convey concepts, not isolated words. This is why one cannot interpret in a vacuum. An interpreter needs a context, however limited, and for this, police reports, depositions, complaints, indictments or grand jury minutes are helpful. When lawyers provide interpreters with these basic documents, they help to prevent potential m ispronounciations, misunderstandings, or requests for clarification. Court interpreters are often faced with the challenge of working with clients, including judges and attorneys, who are unfamiliar with our role. Over the years I’ve developed some useful phrases to convey proper interpreter protocol and avoid ethical dilemmas. Using these phrases illustrates the neutral and objective role that the interpreter plays, defining by example my function in the formal and adversarial setting of a courtroom. We will be dealing with the professional relationship between a social worker and an interpreter and their interactions with people who are emotionally scarred, extremely distressed, and have completely lost their bearings. What are the barriers to overcome in order to reach out to these people and join them in their suffering? How can we create a feeling of trust despite the linguistic, ethnocultural, gender, socio-political, and psychological obstacles? How is it possible for a social worker and an interpreter to join together to help these people take control of their lives despite the vulnerability, culture shock, and fear that they are experiencing? Through psychosocial interventions, we will demonstrate the process used during interviews, which enables us to establish the bond to support them and grasp their innermost feelings. While capturing their spirits, we are able to create some ‘magical moments’ where the client feels free to express himself and gradually regain control over his life. For the past two and a half years, NAJIT has been participating in drafting an industry standard for the interpretation field under the auspices of the American Society for Testing and Materials (ASTM). Although it began as an engineering organization, ASTM now functions as an umbrella organization for setting national standards in a variety of fields. I have been a legal interpreter of Mandarin Chinese since the early 1980’s, when I returned from three years’ teaching in China. Before then, I had studied the language at the undergraduate and graduate levels for seven years. My first husband was Chinese and he spoke little English, so I often found myself in informal interpreting situations, which I discovered I greatly enjoyed. After several interpreting stints with the National Committee on U.S.-China Relations and International Visitors’ Program, I was invited to work in federal court in Manhattan, where a senior interpreter listened to the quality and accuracy of my courtroom interpretation through headphones. Eventually I left New York, but the high stakes, slice-of-life dramas, gratitude of the person needing the interpreter, and my fascination with cultural and linguistic differences have kept me working in the courtroom year after year. Lavaluació de la qualitat en interpretació al final del procés formatiu de postgrau hauria de coincidir, si més no majoritàriament, amb les expectatives de qualitat professionals respecte a un intèrpret novell. Partint daquesta hipòtesi, i inspirant-nos tan en estudis de satisfacció o expectatives de qualitat dusuaris dinterpretació (perspectiva professional) com en els protocols davaluació aplicats a diverses universitats (perspectiva acadèmica), així com en els Models dels esforços de Daniel Gile, la nostra recerca empírica i observacional suposa una contribució a la identificació dels criteris de qualitat en interpretació.Es va enregistrar i transcriure un ampli corpus amb un total de 69 avaluacions de 18 estudiants davant dun total de 7 examinadors en un postgrau dinterpretació de conferència mèdica. Després didentificar els indicadors de qualitat (67) considerats pels avaluadors, es va dur a terme una anàlisi estadística, lestabliment de categories (6) i la identificació de trets distintius entre els avaluadors. La innovació rau en el fet dhaver desgranat els criteris de qualitat implícits a partir del corpus (avaluacions en un postgrau despecialitat), en el mètode emprat per identificar les categories i en el seu processament. Els resultats mostren, entre altres qüestions, que la quantitat de comentaris positius o negatius fets pels avaluadors pràcticament no influeixen en la puntuació atorgada als estudiants.Resumen La evaluación de la calidad en interpretación al final del proceso formativo de posgrado debería coincidir, al menos mayoritariamente, con las expectativas de calidad profesionales respecto a un intérprete novel. Partiendo de esta hipótesis, e inspirándonos tanto en estudios sobre satisfacción o expectativas de calidad de usuarios de interpretación (perspectiva profesional) como en los protocolos de evaluación aplicados en distintas universidades (perspectiva académica), así como en los Modelos de los esfuerzos de Daniel Gile, nuestra investigación empírica y observacional supone una contribución a la identificación de los criterios de calidad en interpretación.Se grabó y se transcribió un amplio corpus con un total de 69 evaluaciones de 18 estudiantes ante un total de 7 examinadores en un posgrado de interpretación de conferencia médica. Tras identificar los indicadores de calidad (67) considerados por los evaluadores, se procedió a un análisis estadístico, al establecimiento de categorías (6) y a la identificación de rasgos distintivos entre los evaluadores. La innovación radica en haber desgranado los criterios de calidad implícitos a partir del corpus (evaluaciones en un posgrado de especialidad), en el método utilizado para identificar las categorías y en su procesamiento. Los resultados muestran, entre otros extremos, que la cantidad de comentarios positivos o negativos realizados apenas influyen en la puntuación que otorgan a los estudiantes. Assessing interpreting quality at the final stages of a students training process at the postgraduate level should be, for the most part, in keeping with quality expectations for novel practitioners. On the basis of such hypothesis, and inspired by studies on quality satisfaction or users expectations (professional approach), assessment protocols used in different training schools (academic approach), and Daniel Giles Efforts Model, our research empirical and observational aims to contribute to identify quality-defining criteria in interpreting.A large corpus was recorded and transcribed, with a total of 69 post-exercise assessments of 18 interpreters taking a specialization course in medical interpreting by 7 instructors. The assessments were scrutinized for evaluative comments which were analyzed statistically. This involved also classifying them in categories (67) and later merging them into 6 category groups. The innovation lies in the very concept of working backwards from a corpus towards implicit quality criteria, in the work on this corpus type (assessments during a postgraduate training course), in the method used to identify categories and in the further processing of the categories. The findings give some solid indications and show that assessors are not too influenced by the number of positive or negative comments they make when deciding what mark they will grant to the students. Takeda, K. “Interpreting at the Tokyo War Crimes Tribunal.” Interpreting vol. 10, n. 1 (2008). pp. 65-83. This paper gives an overview of the interpreting arrangements at the Tokyo War Crimes Tribunal (1946-1948), focusing on some sociopolitical aspects of the interpreting phenomena, and discusses the behavior of the interpreters and monitors during the testimony of Hideki Tojo, Japan’s wartime Prime Minister. It provides a contextualized examination of court interpreting rather than a microlinguistic analysis of interpreted texts. The study demonstrates how political and social aspects of the trial and wartime world affairs affected the interpreting arrangements, especially the hierarchical set-up in which three ethnically and socially different groups of ‘linguists’ (language specialists) performed three different functions in the interpreting process. An examination of the linguists’ behavior during Tojo’s testimony points to a link between their relative positions in the power constellation of the trial and their choices, strategies and behavior in interpreting and monitoring. These findings reinforce the view that interpreting is a social practice conditioned by the social, political and cultural contexts of the setting in which interpreters operate. Interpreters’ criminal liability for incriminatory concealment or disclosure of information, documentation, or facts entrusted to them by third parties has recently become a serious issue for individuals and professional associations. Individual linguists need adequate protection from being prosecuted for carrying out professional duties, and professional organizations need to navigate these turbulent waters between the Scylla of obedience to the law and the Charybdis of protecting members from unreasonable interference. Due to the very nature of our trade, interpreters and translators deal with foreign entities and individuals. We act as intermediaries in communication between parties, and become aware of the content and extent of parties’ relationships and transactions. On many occasions, information disclosed to a translator or interpreter in non-legal settings is on a non-confidential basis and has no legal consequences. However, if the parties’ communication (in which a translator or interpreter participated) involves wrongdoing in the eyes of the government, any translator/interpreter immediately becomes a suspect. Des de sempre hi ha hagut professions amb un prestigi social major que d’altres i, encara que resulta difícil establir quins són els factors que fan que aquest prestigi siga tan inestable, diferents motius van fer que m’interessara per estudiar els factors que conflueixen en la concepció del fet social, principalment del prestigi de la nostra professió d’intèrprets. Aquest estudi realitza una primera anàlisi del prestigi que la nostra societat assigna en l’actualitat a traductors i intèrprets i, gràcies a l’opinió dels espectadors de la darrera pel·lícula de Nicole Kidman, The Interpreter, també de la influència dels mitjans de comunicació en l’opinió que la societat té dels distints grups socials, amb la hipòtesi que gaudeixen d’un impacte considerable i que poden ser grans aliats per defensar els interessos del nostre grup. The practice of having simultaneous interpreters work in teams of two during lengthy assignments, although standard procedure in all other forums requiring interpretation, has never been universally accepted by the courts. In most state and many federal courts, it is simply not done. Attempts by interpreters to institute the policy have met with resistance from judges who consider it wasteful and administrators who cite budgetary constraints. But a study recently conducted at the University of Geneva has contributed important new information on the subject: its findings provide further scientific evidence to support the position that accuracy is directly related to the length of time that a person interprets. Some of you may think NAJIT’s efforts to create a certification program for judiciary interpreters has been a long time coming. Actually, most of you were not even members when the idea began to be seriously considered. I remember sitting with Dagoberto Orrantia and Janis Palma, who was then chair, in a restaurant in San Juan nine years ago having a heated argument about whether or not we should have an exam, what kind of an exam, and how it could be done. And that was only the first of many heated arguments-as Cristina will remember because the importance of the issue makes people very passionate about the subject. According to current Spanish legislation, Translation and Interpreting graduates may qualify as sworn interpreters without taking the exams set by the Spanish Ministry of Foreign Affairs. This makes Translation and Interpreting schools directly or indirectly responsible for the quality of their studentsâ training as far as the professional activity of sworn translation is concerned. In an attempt to describe and analyse the legal translator training they receive at Spanish universities, this paper presents the major results of the analysis of the syllabuses of the subjects implied, with a special focus on the subject areas covered by this training. The Chicago area court interpreters certification project has not been an easy one. The fear of being saddled with unfamiliar standards posed a threat on our already comfortable and established system. Administrators only knew that the court interpreters were getting the work done. Academia knew nothing about court interpreting and very little about the needs of the community for such professionals. With this background, we looked to the certification project as a guiding light. It had literally taken years to have court interpreters and court administrators consider the court interpreters’ certification programme. That is why it is imperative that any policy for offering the certification exams include in the negotiations the members who ultimately will be responsible for offering the certification in any given state. If not done, the objective, which is to certify court interpreters, is not accomplished and this will only be one more exam without much meaning.